It was about four o'clock on the afternoon of July 24th, 1883, that Webb made his fatal trip. He descended the bank by means of a roadway near the famous Clifton House, recently destroyed by fire, and went to the ferry landing. He entered a small row boat, and with "Jack" McCloy, a well known guide at the oars, was rowed to a point down the river a short distance above the old Maid of the Mist Landing. At 4:25 he leaped into the water. The river banks for miles were lined with people. On the bridge there was a great surging mass of humanity. Webb had nothing on his body but a pair of plain, bright - red trunks. His stroke as he pulled away from the boat and swam towards the rapids that were to dash his life out was noble. It was a beautiful sight, and as he rode the first wave of the rapids, just beneath the old railway suspension bridge, the gorge echoed and re-echoed with the cheers of the multitude. 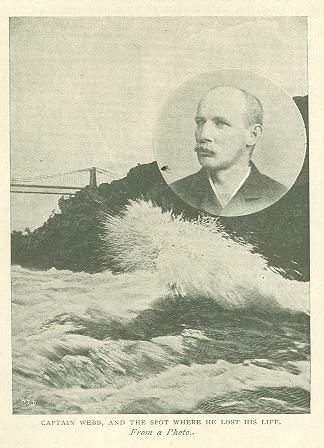 This was followed by a terrible quiet, as Webb was swept onward down the river, into the rapids, by the current from which there was now no escape. The next instant the white-capped waves were dashing over him. Onward he plunged, and the next moment he was lost to sight. Thousands of eyes searched the foamy waters for a glance of the man, but the largest wave in the gorge had been his conquerer. The more quiet waters of the whirlpool were scanned that day until darkness fell, and miles down the river watchers were all along the banks. Then followed days of uncertainty. People were ready to swear they had seen him emerge from the river at various points. It was intimated that he had made the trip in safety, and was being concealed so that his friends might win their wagers. It would take a volume to tell of the strange ideas advanced in those few days. To some it seemed impossible that Webb should die in the river after his accomplishments in other waters. But Webb did die at Niagara. His body was found about noon on July 28th, 1883, by Richard Turner, the spot being about a mile and a half below the village of Lewiston, NY. His body is buried in Oakwood Cemetery, Niagara Falls, NY, and yearly has the attention of members of a society to which he belonged, and also of friends who remember and admire his daring.